More than 130 feet of teletype paper in total, comprising 6 strips, each 8 ½ inches wide, in sections of varying length. Folded down into flat sections 18 inches in length. Minor wear, occasional short tears, faint red ink stain along one edge, last section with full horizontal tear across the text. “It was unknowable then, but so much of the progress that would define the 20th century, on both sides of the Atlantic, came down to the battle for a slice of beach only 6 miles long and 2 miles wide” (Barack Obama). The long-planned D-Day invasion was shrouded in secrecy. The D in “D-Day” stood simply for “day,” as the actual date of the amphibious landing was not fixed until immediately preceding the operation. It was of utmost importance that the Allies restrict information on the invasion on both sides of the Atlantic. Thus contemporary written information predating the invasion is essentially unobtainable. In light of the secrecy around invasion plans, a central aspect of the intelligence operation for the invasion was the feeding of false information to the German military. The Allied program of disinformation, codenamed Operation Bodyguard, aimed to convince Hitler that the invasion would take place somewhere other than Normandy, primarily Pas de Calais in northern France, Southern France, the Balkans, or Norway. The plan was so effective that Hitler delayed repositioning the troops he had placed in Pas de Calais for seven weeks after the Normandy landing, greatly weakening the initial response of the German military. The invasion of Normandy, codenamed Operation Overlord, began with an invasion of the French coastline on June 6th, 1944. The invasion force consisted of 3 million men (160,000 of whom landed on D-day), 13,000 aircraft, 1,200 warships, 2,700 merchant ships, and 2,500 amphibious landing craft. The Allies created new technology for the landing, including a new type of tank and even two artificial ports. It remains the largest seaborne invasion in history. The effect on public morale in the United States and Britain was enormous. The landing of troops on the ground gave Britain renewed vigor in a war that had badly sapped public spirits. The American the public had been long gearing up for the invasion, and its realization galvanized public support. 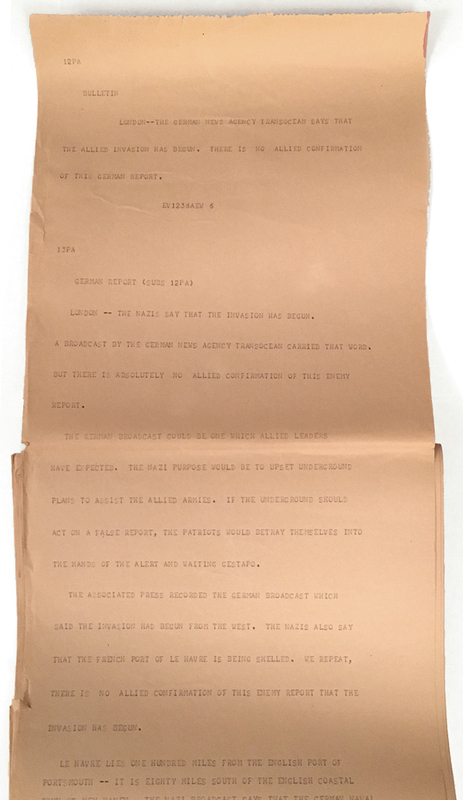 This fragile strip of paper is the earliest announcement of the greatest event of the 20th century: the beginning of the liberation of Western Europe and the defeat of Nazi Germany.